Leg 3: Podium again in Third place! 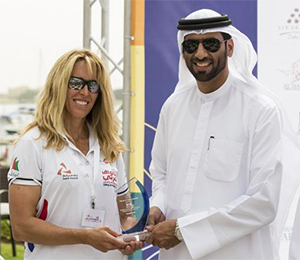 It was a 60-nautical mile sprint from Abu Dhabi to Dubai, and a close battle between us and the Messe Frankfurt Sailing Team for second place. Although the Messe team managed to overtake us, and finish one minute ahead in second place, they certainly had to work for it! Read More. The last bit into the finish line we had Huda and Khuloud trimming with Eptisom driving the boat, as we struggled with equipment problems. They were calling for us to hike hard when puffs hit, and they did a great job. My goal has always been to see improvement in every single day of racing and so far that has been achieved. I am really pleased with the progress of the team – all of us- because each of us always has room for improvement. That is the beauty of sailing, we are always learning. Read More. 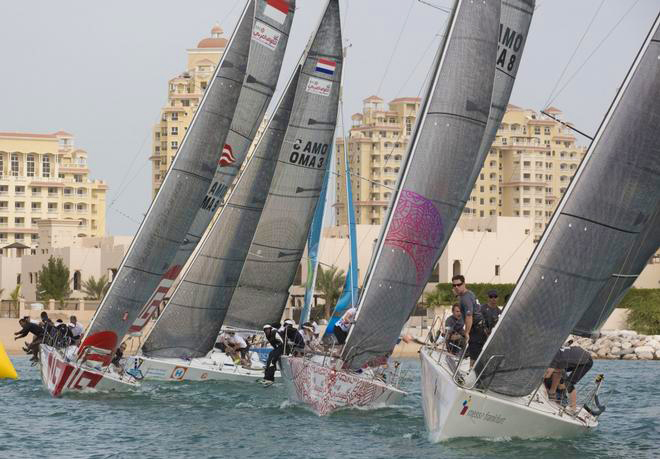 The inport racing were action packed, while tucked in the little harbor by the yacht club in Ras Al Khaimah. It was fun and we ended up third for the day, mixing it up with EFG Bank and Delft. 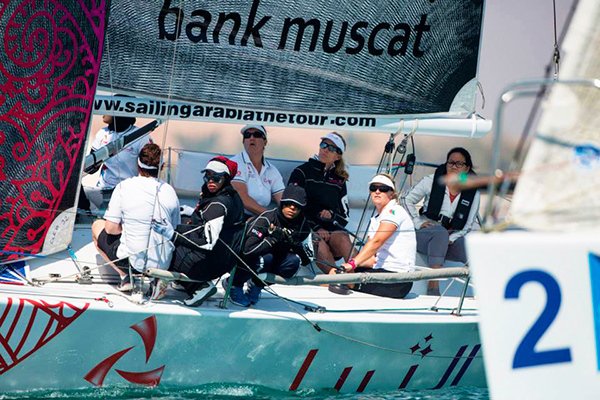 The Omani women had a ball, and were abuzz after! Every race they are growing as sailors. They are opening up to us as well, showing more and more personality that is even more fun. At the day’s awards ceremony, when we were called up on the podium, I was shaking hands with the dignitaries, including various sheiks. One of the sheiks pulled his hand back before I could do so. In our culture, it would be a gross insult, but in their culture – I was told – it was a sign of respect to his wife and to me. It is a reminder to not frame experiences simply in our own western frame of mind, but to be open that there are other ways out there. At any rate, I like having the Omani women up on the podium and helping them feel that they are equally deserving of standing up there strong and proud. Read More. Leg 5 of SATT includes strict limits about where we can go. We must stay close to shore in order not to wander into Iranian waters; dodging rocks and other military forbidden areas, as well as watching for smugglers and, of course, pirates. We leave RAK at 10 am and our next port is around the top down into Dibba, Oman. It is the second longest leg of the race. We will have Omani Naval Patrol with us along the way. The forecast is for a fast leg. We will be downwind initially with spinnakers up, getting through the strait at sunset or just past. Doing so in the daylight will be VERY helpful. On the other side, it is forecast to be really windy. Up to 30 knots blast reaching. Wet and woolly. However, there are cliffs and mountainous regions to contend with, so some don’t believe we will get that wind. I am as adventurous as any, but I must admit a blast reach in 30 knots with fire hose effect is not making me super excited – EXCEPT for the effect of an early finish. We have a lot of fishing nets to contend with as we get towards Dibba, and sudden maneuvers in 30 knots are hairy. Inport racing, preparing for fishing nets, making progress! Heading off tomorrow to Dubai with an early start at 7 am. Last year some of the most iconic photos came from a dawn start out of Abu Dhabi. The forecast is for light, upwind reaching, with some upwind work. The models are a bit mixed about how far to go offshore, but there are fishing nets and waypoints to handle so that will be determinative. Last year we had to navigate through the fishing nets at night, and it was a very difficult! Ugh. It is a shelf and miles of fishing nets… Allegedly, if you flatten the boat it will eventually “pop” up over the nets and get through, but while racing there last year felt like running aground and in one case we definitely didn’t get off, and had to have the local fisherman help us. Cutting nets away is a crime so this is serious business. Today was inport racing. Light and weird helicopter puffs off the skyscrapers made it difficult. We had good starts, but sometimes didn’t take the immediate risk to grab a temporary puff. In the end we did alright, but not great. 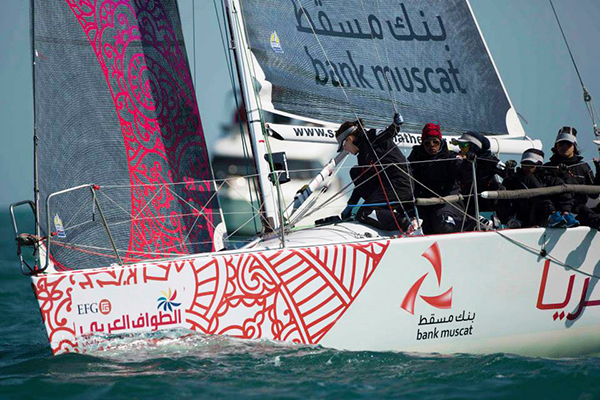 The Omani women had fun, and today’s big lesson was learning about the importance of weight movement on the boats. I wish we had had more time to train before dropping them into racing, because it is hard to learn while in the middle of a race. Explanations get shorter, time and opportunity for trial and error get small, and focus on more specifics limits the big picture learning. Tonight, two of the women missed the briefing (that we always have) for the next leg. I was pretty displeased, as our briefings are a basic requirement. It was puzzling and uncharacteristic of these two women. They tracked me down in my room late tonight to say how sorry they were. They had gone out, and ran into bad traffic (happens here), and couldn’t get back. They felt so bad; they weren’t going to be able to sleep without speaking to me. I appreciated that – we all muck up – and I have felt bad like that too. With a stern warning, we are good to go tomorrow. If that’s the worst of it, I think we can deal! Today we were on the podium to receive our prize for 3rd place overall in the race. With many legs to go, its anyone’s game. It was absolutely fantastic to be able to have our team on the podium, and let the Omani women feel their rightful place to be in the mix with the best. Everyone deserves to know that feeling, although not without some sacrifice and hard work. 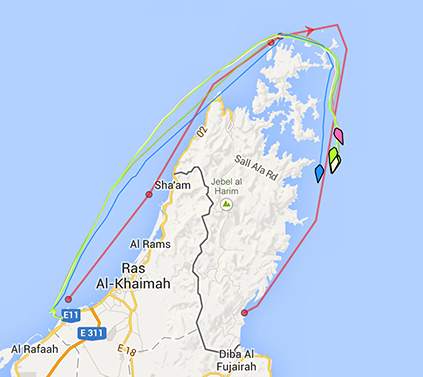 Click to track the race from the Sailing Arabia The Tour website! The start out of Doha was delayed because of customs (this is a reoccuring theme) so by the time of the start we had a solid 16 knots in the afternoon. The ride from Doha to Abu Dhabi was quick as expected, downwind the entire 159 miles, with some fire-hose spinnaker reaching in the middle of the night thrown in. The start out of Doha was delayed because of customs (this is a re-occurring theme) so by the time of the start we had a solid 16 knots in the afternoon. 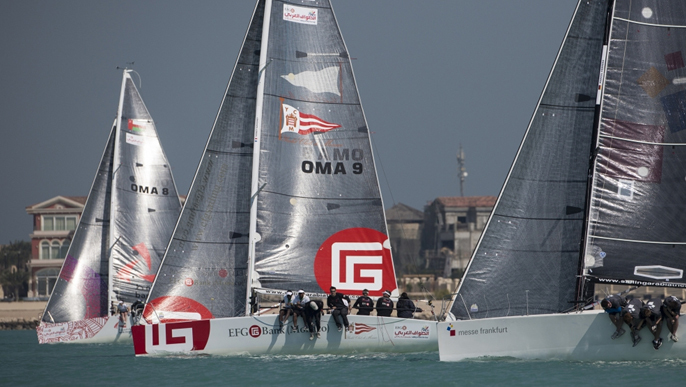 We battled it out inch by inch against EFG Bank (race favorites and eventual race winner) and Messr Frankfurt into the night changing positions back and forth with them. 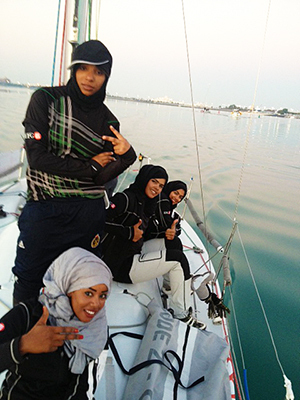 This was the Omani womens’ first “real” offshore and full night out, so I was interested to see how they would cope with the physical and mental demands of the racing. I was hopeful that it wasn’t going to be too windy so that we could allow them to go down below in rotations to get an hour of sleep. Initially, with the wind square behind us, they could do that because the boat sails flat. However, as the wind headed us (went forward) making us sail a much higher, difficult angle we needed them sitting on the high side of the boat for balance. The sailing was fast and furious. At one stage we got into a high road – not -quite – luffing match with Messr Frankfort and won that one, but they dove low, sneaking by us. The Omanis were troopers and worked hard all night, even when they couldn’t keep their eyes open they continued to try. Epitsom, who is our one and only returning sailor from last year has really stepped up and proven herself to be an asset. She does all the jobs asked and has really grown in her skill set. During the night when it was hard, she was sending the other Omani girls down before taking her break. When her break came to an end she uncomplainingly came back up on deck. Onshore, Epitsom is the one who has asked for more coaching and feedback on what she needs to do to improve and about her strengths/weaknesses. We had a big coaching session last night and discussed her strengths in potential positions and also how to deal with outside naysayers – a concept we ALL have dealt with in our lives. We ended up finishing fourth for the leg, right behind Messr Franfort It was a great finish and the team did great work. Navigating the myriad waypoints and safety hazards was not an easy task – Liz took it on magnificently; Mary was fantastic trimming and doing some driving;and Lauren managed the bow and was a rock while trimming as well. After the finish, we found out there had been a port/starboard incident at the last rounding mark between EFG and Delft. EFG had filed a protest. The hearing was held yesterday and EFG won. Delft got thrown out for infringing the rule. The rule says that a boat on starboard has rights and a port boat must keep clear – just like right of way on roads. That means we move up to finishing third. So my goal of getting the girls on the podium has been fulfilled! I am pleased for them. I still want another podium, and of course will work hard to get that. There is a lot of racing left! Today is the inport race in a tiny harbor in front of Abu Dhabi. The wind is crazy because it shifts amid the skyscrapers, and the water is very shallow and not well marked. Makes it a bit sketchy at times. Joining us for the inport race is a team from Abu Dhabi. Initially, they wanted to compete on the entire SATT race, but couldn’t get it done in time. Hopefully, this will get them some visibility and generate some sponsor interest, so they can join next year. Thank you Llyod Images for photos. Bahrain to Qatar – 4th place! After finishing fourth on the first leg from Bahrain we stopped here in Doha Qatar for a day of in-port racing just outside the Pearl Marina. 8-12 knots of wind gave us great training for our novice crew. I see a noticeable progression in the Omani women’s skills. Our 3rd place finish in race 2 was a great confidence boost to the team – thanks to a great start and good wind/strategy calls. We moved Raham, the young woman from the Oman Navy, up to helping at mast and floater position, and she is really enjoying the increased physicality of those jobs. She had previously been on main. Being a novice at both sailing and English proved a big challenge for everyone, as the main position is integral to the communication flow on board. Like any team, each position requires different skills and delivers unique attributes to the success formula, so figuring out who fits best into each role takes time. Ideally this would have been done far in advance during practice sessions. But with last minute team changes we are on a steep learning curve in the midst of competition. The wind for our next leg looks stable and manageable. It should be a quick run. We will be under spinnaker with wind behind us the entire way, except for the short upwind leg with a turning mark. The route is filled with many navigational hazards such as oil fields, islands and shallows. Liz Baylis, our experienced navigator, will have her hands full plotting waypoints and keeping her eyes peeled for unlit marks – an increased challenge when racing under spinnaker. The current routing puts us into port early morning, around 6 am. This will give us a needed rest day in Abu Dhabi. As the event progresses and we continue to tune our boat, our team is starting to settle in and find a rhythm. I hope the progression continues for us. The other team competitors have commented to me on how well we are sailing, and it feels good to have them recognize the potential in our novice young women. Currently we are on the heels of the Dutch team, chasing them for third overall, with a lot of racing left to go. We have developed a great relationship with this team. In Bahrain, their navigator was very helpful with some of our electronic problems, and when their batteries died (no engine) after the finish of the first leg we threw them a tow line until a power boat came by to take over the job. This is a great part of the culture of sailing – although we are competitors, we are friends, allies and have each other’s backs. 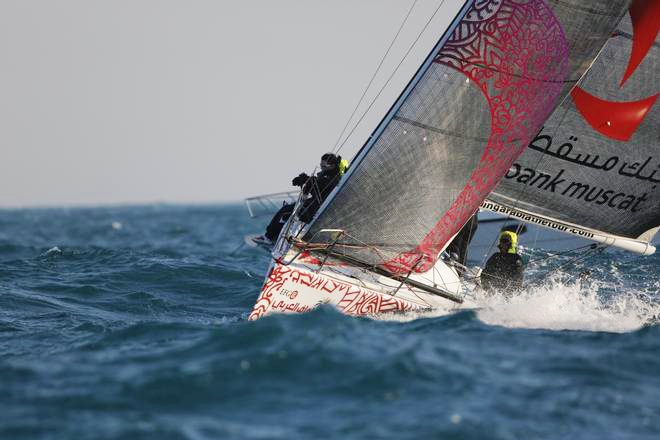 Today we head off on the longest leg of the SATT – 160 nautical miles from Doha to Abu Dhabi. Ok – off we go… wish us luck!